Let’s start with a quick look at what comes with the game. Most obvious is the big gameboard. It’s a map of the galaxy, with 36 worlds connected by jumplines. It also has a Prestige Meter (because your Prestige matters) and a place to keep the current Contracts (that place being the colored blocks along one edge of the board). In one corner is a key to the jumplines, but basically, the longer the jump, the higher you must roll to make the jump. There is a big deck of cards. If you check a card you’ll see that it’s divided in half. The colored part is a Contract — when someone delivers a Contract and you need to replace it with a new Contract, you draw a card and use the Contract end. (We’ll cover how to do that in a few minutes.) The white half is a Trader’s Luck card. When you draw a card to play from your hand, it’s the Trader’s Luck end of it that’s important. Trader’s Luck cards have all sorts of effects. Some are good and you tend to play those cards on yourself: bonus Prestige, extra actions, a card that lets you use other Traders’ stations. Some are not so good, and are marked as Calamities: lost Prestige, lost actions, just plain Lost in Space — those you play on other Traders. But a Trader can escape your Calamity by playing an Avoid a Calamity. There are over two dozen types of cards, and many of those have varying effects. The cards are marked, and you use the cards that match the version of the game you’re playing. Oh yeah, the game has five versions. At the youngest level (age 7+) you actually only use the cards as Contracts — you don’t use any Trader’s Luck. At the second level (age 10+), you only use the 36 cards that are easiest to understand and are the least hostile. At the Family level (age 13+), you add the mid-level cards — a little more complicated, a little more aggressive. And at the two highest levels, you use all the cards, including those that destroy stations and switch your ship with another Trader’s ship. There is a set of markers for each Trader. Most of these are station rings, but you also have a marker for the Prestige Meter and two markers to keep track of which cargos you’re carrying. You also get a neat little ship to show where you are on the game board galaxy. There is a stack of Imperial $tarBucks (the bank), six pairs of Contract arrows (we’ll get to those in a couple of minutes), a set of shiny dice, and a few other miscellaneous markers for special circumstances that we don’t need to worry about right now. There are also several sets of player mats for the different levels, each with a quick ref on it for setup, play, and victory conditions. Let’s talk about how you play. Some of it’s obvious — you take turns, you go in a circle, someone eventually wins. Some of it’s less obvious — you take 5 actions per turn, and an action can be jumping to another world / picking up a cargo / building a station / or conducting local business (earning a $tarBuck when you can’t do anything else). In the endgame, there’s one more possible action: petitioning the Emperor to be granted your final Imperial Mission. The number you must roll on one die to make a jump ranges from 2 (or better) to 6. The color of each jumpline (along with a small marker) indicates what you must roll to use it. But if you have a station — which always has a navigation beacon — at the world you’re trying to reach, you get there without a roll (although it still costs an action). And you can negotiate permission to use other Traders’ station beacons the same way. All this jumping around is so that you can pick up cargos and deliver them, for a cash payoff and to generate Prestige. You get 5 dice at the beginning of your turn, and you use the dice to keep track of how many actions you’ve used — each time you take an action (whether you rolled a die or not), you move another die into the “Used Actions” box on your player mat. When all 5 are in the box, your actions are over for the turn. To set up the game, you draw a card for every Trader in the game, and tuck each one under the board at one of the colored blocks so that only the Contract part is showing. The Contract card tells you where to pick it up, where to deliver it, and how many $tarBucks and how much Prestige you get for making the delivery. Then you mark on the board where you need to pick it up (using a “From” arrow) and where you need to deliver it (using a “To” arrow). The arrows are color-coded and numbered to match the color and number of the matching Contract block. When you deliver the cargo for a Contract, you collect the Payoff and Prestige marked on the Contract. If someone owns a station at your delivery world, that Trader earns the Station Fee that is also marked on the Contract. (That comes from the bank, not from you.) Then someone draws a new Contract, the arrows are moved to mark the new “From” and “To” worlds, and you continue your turn. So in your turn, you take 5 actions, jumping from world to world, picking up and dropping off cargos, building stations and (when nothing better is available) conducting local business. You play cards (each card tells you when you can play it) and draw one new card at the end of your turn. You can’t hoard cards — you must discard down to 2 cards after you draw. As you play, you accumulate money and Prestige. When you have at least 50 $tarBucks to pay your filing fee, 15 Prestige, and 4 to 8 stations (the more Traders in the game, the fewer stations are required) you may use an action to petition the Emperor for a final Imperial Mission. Your base required roll is a 5+ (on one die). But if you accumulate more Prestige, you can gain a +1, or even a +2, on the roll. And a Zap (a Trader’s Luck card) can add to or subtract from your roll. Succeed and you get your Imperial Mission. Fail, and you lose 5 Prestige. You can petition again anytime you want, as long as you have at least 15 Prestige. For any petition after the first, your filing fee is $20. When you’re granted your Imperial Mission, you draw Contracts until you find one with a star on it. A star on it means it’s long enough to satisfy the Emperor. (He won’t give you a run that’s too short — it wouldn’t prove that you’re really the best.) Now all you have to do is pick up your designated cargo and deliver it before anyone else finishes their own Imperial Mission. It’s not uncommon for everyone to be on their Imperial Mission by the time someone wins the game! • Building a station costs 5 $tarBucks and earns you 1 Prestige. • Delivering a cargo does not cost an action, and must be done as soon as you arrive at the delivery world. That means that you can’t build a station there first, to collect the Station Fee. 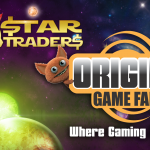 • With 3 Traders, each Trader gets an additional station to start the game. With 2 Traders, each Trader gets an additional 2 stations, and you play with three Contracts, not just two. • Contract #1 is always the VIP Contract, and pays an additional 2 Prestige. • You can trade $tarBucks, stations and cards, but not Prestige. You can trade cargos, but only when you’re at the same world. We’ve playtested this many times, including this last year at Gencon’s Playtest Hall (thanks, guys!) and PAX South’s Tabletop exhibition area (likewise, Andi!). Many experienced gamers sat down for the first time and figured that they know exactly what they needed to do to win. By the end of the game, they realized that the path to victory isn’t nearly as obvious as they had assumed. Many reviewed the Personalities and knew immediately which ones were overpowered, and which ones were underpowered … and then reversed their opinions after playing a game. 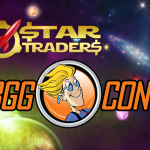 Star Traders isn’t won consistently by playing a specific strategy. Sometimes the dice and the cards will align with that strategy, and you win. But the more consistent path to victory lies in flexibility and in adjusting to the circumstances, and that takes awareness of everything that’s going on around you. In general, I designed for fun. 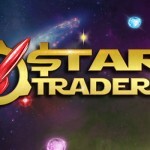 (I think Star Traders succeeds at that. We collected feedback forms from the players at both shows, and 96% [PAXS] and 97% [GC] wanted to play again.) There are some obvious steps to take — for example, building stations at important intersections, or where a rich cargo is about to be delivered — but there’s an opportunity cost to everything you do, and forgoing one task in favor of another will often rise up to bite you. You can’t calculate exactly what will happen — there are too many factors out of your control. Star Traders is a very colorful game. We have tried to make it accessible for colorblind players of every sort. We have been at least partly successful, and we intend to do more. For example, the jumplines are color-coded, but they also have a small marker that indicates the roll necessary to use each one. The station rings have a different icon for each color, but we’re also going to do more to distinguish the actual colors of the rings. The Contract blocks (1st, 2nd, etc.) are color-coded, but are also clearly numbered. The ships are the only thing that we’re not being able to mark (they’re stock items), and we include two extra ships (one black, one white) that can be used to help colorblind players keep track of everyone. We don’t have any colorblind regular playtesters, so we’re dependent on other occasional playtesters and people who love games. We would appreciate any input you have in this regard once you have The Voice.